Get ready for the Harvest Moon. Depending on where you live on the planet, it’s either Wednesday or Thursday of this week. “In traditional skylore, the Harvest Moon is the full moon closest to the autumnal equinox,” EarthSky reports, “and depending on the year, [it] can come anywhere from two weeks before to two weeks after the autumnal equinox.” For 2013, that changing of the seasons happens on September 22 — just a few days from now. Unlike the Blue Moon we covered back in August, the Harvest Moon behaves differently than a typical full moon. “Throughout the year, the moon rises, on average, about 50 minutes later each day,” according to NASA Science News. “But near the autumnal equinox … the day-to-day difference in the local time of moonrise is only 30 minutes.” Why does that matter? Simply put, agriculture. "Shine on, Harvest Moon" is the name of a popular early-1900s song credited to the married vaudeville team Nora Bayes and Jack Norworth. It was one of a series of Moon-related Tin Pan Alley songs of the era. The song was debuted by Bayes and Norworth in the Ziegfeld Follies of 1908 to great acclaim. It became a pop standard, and continues to be performed and recorded into the 21st century. During the vaudeville era, songs were often sold outright, and the purchaser would become the songwriter of record. John Kenrick's Who's Who In Musicals credits songwriters Edward Madden and Gus Edwards, while David Ewen's All the Years of American Popular Music credits Dave Stamper, who contributed songs to 21 editions of the Ziegfeld Follies and was Bayes' pianist from 1903 to 1908. Vaudeville comic Eddie Cantor also credited Stamper in his 1934 book Ziegfeld - The Great Glorifier. Oh, Shine on, shine on, harvest moonUp in the sky;I ain't had no lovin'Since April, January, June or July.Snow time ain't no time to stayOutdoors and spoon;So shine on, shine on, harvest moon,For me and my gal. I can't see why a boy should sigh when by his sideIs the girl he loves so true,All he has to say is: "Won't you be my bride,For I love you,I can't see why I'm telling you this secret,When I know that you can guess. "Harvest moon will smile,Shine on all the while,If the little girl should answer "yes." Is this B&W movie old enough for the public domain now Andy? NM, I can't find it :-?? On average, the moon rises about 50 minutes later each day. But when a full moon happens close to the autumnal equinox, the moon (at mid-temperate latitudes) rises only about 30 to 35 minutes later daily for several days before and after the full Harvest moon. Why? The reason is that the ecliptic – or the moon’s orbital path – makes a narrow angle with the evening horizon around the time of the autumn equinox. The narrow angle of the ecliptic results in a shorter-than-usual rising time between successive moonrises around the full Harvest Moon, These early evening moonrises are what make every Harvest Moon special. Every full moon rises around sunset. After the full Harvest Moon, you’ll see the moon ascending in the east relatively soon after sunset for a few days in a row at northerly latitudes. The lag time between successive moonrises shrinks to a yearly minimum, as described in the paragraph above. Because of this, it seems as if there are several full moons – for a few nights in a row – around the time of the Harvest Moon. Is the Harvest Moon bigger, or brighter or more colorful? The Harvest Moon is just an ordinary full moon. It isn’t really bigger or brighter or more colorful than any other full moon. But you might think that it is. Why? It’s true that, in some months, the full moon is closer to us in orbit than others and so truly appears bigger. But the distance of the full moon depends on where the moon is in its orbit. There’s no correlation between each year’s Harvest Moon and the moon’s location in orbit (the actual full moon size). It’s different every year. The 2013 Harvest Moon is pretty close to an average-sized full moon. The biggest full moon for 2013 falls in June. Nowadays, people call these close full moons a supermoon. The bigger-than-usual size of a moon seen near the horizon is something else entirely. It’s a trick that your eyes are playing – an illusion – called the Moon Illusion. You can find lengthy explanations of the Moon Illusion by googling those words yourself. How did the Harvest Moon get its name? Why is this moon – the moon closest to the autumnal equinox – called the Harvest Moon? When is the Southern Hemisphere’s Harvest Moon? For the Southern Hemisphere, the autumn equinox falls in March. So the Southern Hemisphere always has a full moon with these same characteristics – rising shortly after sunset for several nights in a row – in March or April. What are some other full moon names? Every full moon has a name. The names vary in cultures around the world, and they particularly vary between the Northern and Southern Hemispheres. One of the most famous full moon names – other than Harvest Moon – is Hunter’s Moon. That’s the name for the full moon after the Harvest Moon. For the Northern Hemisphere, this year’s Hunter’s Moon comes on October 18. Read more about full moon names here. Bottom line: The Harvest Moon in 2013 comes on the night of September 18-19 for us in the U.S. It falls on the night of September 19-20 in Asia. The Harvest Moon is the full moon closest to the autumnal equinox, which in 2013 comes on September 22. The exact time of fullest full moon for this month is September 19 at 11:13 UT, or 6:19 a.m. CDT in the central U.S. The night of September 18, 2013 will have a beautiful bright full-looking moon, as seen from around the globe. So will the night of September 19, 2013. The Harvest Moon is not really bigger, brighter or more pumpkin-colored than other full moons, but it’s special because, at this time of year in the Northern Hemisphere, the time between successive moonrises – from one night to the next – is shorter than usual. Enjoy! Unlike Earth’s moon, many moons in the solar system orbit above the equator of their parent planets. If our moon did likewise – orbited around the Earth’s equator – then the moon would always rise due east and set due west every day. But our moon’s orbit is inclined to the plane of the Earth’s equator. That’s why our moon, as it rises and sets each day, spends about half the month rising and setting south of due east and west, and the other half of the month rising and setting north of due east and west. It’s this inclination of the moon’s orbit that’s responsible for the grand parade of moonlit nights that comes every year with the full Harvest Moon – the closest full moon to the autumn equinox. In 2013, the full Harvest Moon phenomenon begins on the night of September 18-19. There will be bright moons ascending in the east, around the time of sunset, for the several nights after that, for us in the Northern Hemisphere. In September 2013, for example, the moon swings farthest south for the month (19.7o south of the equator) on September 12. Then the moon climbs farthest north for the month (19.6o north of the equator) on September 24. The Northern Hemisphere’s full Harvest Moon falls on September 18-19, 2013, as the moon is going eastward – as well as northward – in its orbit. Every full moon rises around sunset, and sets around sunrise, providing moonlight all night long. On the average, the moon rises about 50 minutes later each night after the full moon – though the lag time between moonrises is reduced to a yearly minimum after the full Harvest Moon. This is because the moon rises farther north along the eastern horizon each day for days on end after the Northern Hemisphere’s full Harvest Moon, causing the moon to rise earlier than usual and to provide several nights of dusk-till-dawn moonlight. The inclination of the moon’s orbital path to the plane of the Earth’s equator changes over a cycle of 18.6 years. For instance, in the year 2006, the moon in its monthly travels swung from about 28.5o south to 28.5o north of the Earth’s equator. Sometimes this extreme inclination is called a major lunar standstill. The greater inclination of the moon’s orbit accentuates the effect of the Harvest Moon. In the year 2015, in contrast, the moon’s monthly travels will only take the moon from about 18.5o south to 18.5o north of the Earth’s equator. 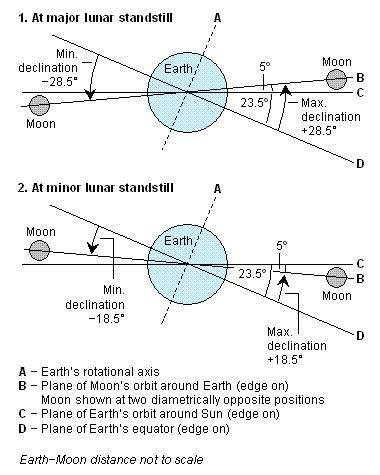 This minimal inclination of the moon’s orbit is sometimes called a minor lunar standstill. A minor lunar standstill acts to lessen the effect of the Harvest Moon. So we’re closer to a minor lunar standstill than a major lunar standstill in 2013. Therefore, the diminished inclination of the moon’s orbit to the equator lessens the impact of this year’s Harvest Moon. In fact, the next major lunar standstill year won’t be forthcoming until 2025. The full moon occurring most closely to the autumnal equinox (the Northern Hemisphere’s September equinox/Southern Hemisphere’s March equinox) enjoys the designation of Harvest Moon. The full Harvest Moon will come on September 19, 2013, in the Northern Hemisphere – and to the Southern Hemisphere on March 16, 2014. However, there is no Harvest Moon at the equator and not enough of one to say so in the tropical regions of the globe. You really have to be well north (or south) of the tropics to observe the year’s grandest parade of moonlit nights around the time of the autumn equinox. The farther north or south of the Earth’s equator that you live, the longer the procession of moonlit nights accompanying the harvest season. The term Harvest Moon might be of European origin, because northern Europe is much closer to the Arctic than to the tropics. Before the advent of artificial lighting, people planned nocturnal activity around the moon, knowing the moon provides dusk-till-dawn moonlight on the night of the full moon. But farmers of old were also aware that the Harvest Moon – the closest full moon to the autumn equinox – could be relied upon to provide dusk-till-dawn moonlit for several days in a row at mid-temperate latitudes, or even as long as a week straight at far-northern latitudes. This bonanza of moonlight in the season of waning daylight remains the legacy of the Harvest Moon. In the Northern Hemisphere, the moon rises farther north along the horizon each evening for a number of days following the appearance of the full Harvest Moon. This northward movement along the horizon reduces the lag time between successive moonrises, so the moon rises at or near the time of sunset for several days in succession. (In the Southern Hemisphere, the full Harvest Moon will occur in March 2014, as the sun is moving maximally southward from night to night.) In fact, it’s even possible – in or near a major standstill year – for the moon at to rise at an earlier time than on the previous day at high northern (or southern) latitudes. For a prime example, see the chart below for Anchorage, Alaska, noting the moonrise times in September 2005. Also, note the moonrise times for September 2015 in Anchorage, Alaska, during the year of the minor lunar standstill. Obviously, the minor lunar standstill lessens the impact of the Harvest Moon.